The McLane Foundation has provided continued support to the Mercantile Library, including grants to refurbish the Library’s historic Steinway piano, underwrite the Executive Director position, and install a Hearing Loop to benefit literary event attendees who require hearing aids. 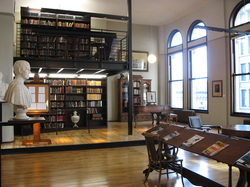 Organized in 1835, the Mercantile is the city's senior library and one of the oldest cultural institutions in the midwest. The name refers not to the collection but to the Library's founders who were young merchants and clerks. To fulfill its mission as the literary center of the region, the Library maintains and expands its historic collection of books and presents a rich schedule of events of interest to anyone who enjoys books and reading. Throughout the year there are visits by authors and writers, book discussions, workshops, and forums. Additionally, the Library is home to a collection of artworks including portrait busts, paintings, and the sketchbooks of the Cincinnati-trained artist Elizabeth Nourse. The Library also presents musical events. You can find out more about the Mercantile on its website.